One of the leading lights of the late 1960’s blues boom, The Climax Blues Band was formed in Stafford, England in 1968. Renowned for their musical virtuosity, the scorching lead guitar work of Peter Haycock and the multi-instrumental skills of Colin Cooper, they were as well loved on the college scene as in the record store and would soon build a huge and loyal following across Europe while conquering the charts in the mid-seventies with the perennially popular FM hits “Couldn’t Get It Right” and “I Love You”. Brilliantly conceived as those singles were they were somewhat atypical since the band’s repertoire was steeped in a harder rocking blues sound. Like their American counterparts Canned Heat the CBB boys knew their roots stuff inside out and were men operating in what was often a boy’s world driven by fashion rather than innate knowledge of the American delta. In their early phases they released one strong long player after another and we’re delighted to offer their Harvest years – A Lot of Bottle, Tightly Knit, Rich Man – their switch to Polydor – Sense of Direction, FM/Live and Live. Look out too for the Harvest Heritage compilation 1969/72. Originally known as the Climax Chicago Blues Band our heroes hailed from the Midlands and set their sights set on emulating the chops and dues paying school of British blues bands throughout eternity. The Climax CBB (or Climax Blues Band whenever the spies from US group Chicago were watching) were the antithesis of anything remotely trendy. You could see that in their album artwork. Take Tightly Knit – front cover featuring crop head with socks stuffed in mouth – and Rich Man – with its vaguely tetchy anti-authority vibe – were almost precursors of the urban agit prop movement. On the former disc regulars Colin Cooper, Peter Haycock and Derek Holt gave it the working class Staffordshire treatment on the rippling “Shoot Her If She Runs” and the Al Capone epic “Who Killed McSwiggin”. Rich Man also fingers that desolate part of the early seventies when Britain was candlelit. “Mole On The Dole”, “You Make Me Sick” and their take on Son House’s “Don’t You Mind People Grinning In Your Face” have the whiff of longhaired punk. Both CDs come with bonus material, including an authentic version of “Spoonful”. If nothing else these albums shone a light on an era that’s often neatly boxed off into glitter and singer songwriter compartments. This lot was grittier than that and had an air of the cynical Potteries about ‘em. Their first two albums, The Climax Chicago Blues Band and Plays On were well received in the weekly music press. Singer, sax player and harmonica man Colin Cooper (1939-2008) had an anti-hero image and took no prisoners while Pete Haycock was a fully-fledged Black Country axe merchant. Bassist and keys fellow Richard Jones and drummer George Newsome manhandled a ferocious backbeat. Chicago Climax Blues Band had a heavy reputation and record companies came sniffing again once their first contract elapsed. Their Harvest debut, A Lot of Bottle, combined excellent in-house songs like “Country Hat” and “Brief Case” with brilliant blues covers on Willie Dixon’s “Seventh Son” and Muddy Waters’ “Louisiana Blues”. By now Derek Holt was on bass and Arthur Farmer supplied the organ work. Produced by Chris Thomas at AIR Studios (with George Martin taking a fatherly interest) this remains a genuine classic of 1970. As Climax Chicago they recorded Tightly Knit with its striking Hipgnosis cover photograph looming menacingly from the racks. Again the band’s compositions and instrumental dexterity make for grand listening as we urge you to rediscover this 1971 gem. Their version of “Come On in My Kitchen” pays full homage to Robert Johnson but really revs up proceedings with a power that Led Zeppelin couldn’t outdo. Rich Man paired them with American producer Richard Gottehrer (co-founder of Sire Records and a leading light on the New York No Wave scene that spun round CBGB’s) and he encouraged even more anarchy in the ranks during “Mole on the Dole” and “You Make Me Sick”. Considering this was recorded in 1972 it’s light years away from pub rock but veers much closer to urban punk. Sense of Direction arrives via the Climax Blues Band name (1974) and is solely band driven: it’s all killer, no filler with Gottehrer laying a bleak atmosphere across haunting items like “Shopping Bag People” and “Losin’ the Humbles.” A totally underrated disc this is a fabulous showcase for Haycock’s stunning slide guitar playing, not to mention his masterful twelve and six string acoustics. Cooper also excels on clarinet and the sax family while Holt’s Fender work is exemplary. The Climax cats’ commercial zenith follows soon after once radio latches on to “Couldn’t Get It Right” and “I Love You” but we pick up the story again with their Virgin album, Sample and Hold (1983) a rebirth of the older sound with Henry Spinetti on drums. Another one to discover, Sample and Hold scores highly on the opener “Friends in High Places” and the catchy “Doin’ Alright” while “Heaven and Hell” locks on to an almighty groove. The key single here is “Listen to the Night”, a major radio hit in Germany. To catch a selection of the best then head for Collection ’77-’83 or dig up Back to Back: Sense of Direction/Stamp Album. Sadly Cooer and Haycock are no longer with us but a version of the band flies the Climax flag to this day with the ever-reliable George Glover still bossing the keyboards and backing vocals. Anyone who has come across one of their FM staples or enjoyed the signature hit tunes is well advised to dig much deeper and discover the parent albums. Far from being a straightforward retro act the Climax Blues Band (and associated variations) are one of the great British institutions. It’s high time they got their dues. 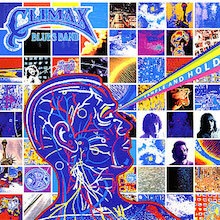 Climax Blues Band had undergone a few changes by the time they cut Sample And Hold in 1983. While Peter Haycock (guitar and vocals) and Colin Cooper (sax and vocals) were still holding the fort, they had sampled a new rhythm section. The latest recruits were George Glover on keyboards, Dave Markee on bass and Henry Spinetti on drums. Together they kept the Climax flag flying. This song-packed ten original LP track CD kicks off with an upbeat and optimistic sounding Friends In High Places , with the vocal harmonies set in place by the old firm of Haycock and Cooper. Peter's guitar solo on this song is especially effective. Although the overall band sound veers towards modern Eighties pop, the guitar and drums, while still rock and strings are brought into play on The End Of The Seven Seas . A fine album with informative CD liner notes that put a much loved British band's career and this album into perspective. A follow-up album was in the works, but Cooper bowed out, citing personal reasons.